Fire up your next cookout with booze-inspired sauces including: Sriracha, Habanero, and Ghost Pepper. Grill-meisters and spice fiends: We've got your new secret ingredients. Fire up your next cookout with this trio of spicy sauces that include boozy flavor notes. 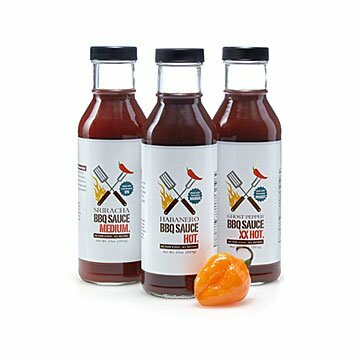 Made in small, all-natural batches, the set of three fiery varieties include: Thai chile Sriracha with notes of IPA (medium), Habanero with a touch of Kentucky bourbon (hot), and a Ghost Pepper with hints of whiskey (very hot). Use them to marinate any of your go-to BBQ foods, or as delectable dipping sauces on the side. A spot-on gift for foodie friends or queens (and kings) of the cookout, the set gives new meaning to "cooking with heat." Made in Athens, Ohio.